The fourth design in a series of vintage nursery rhymes that many of us grew up with and remember fondly. 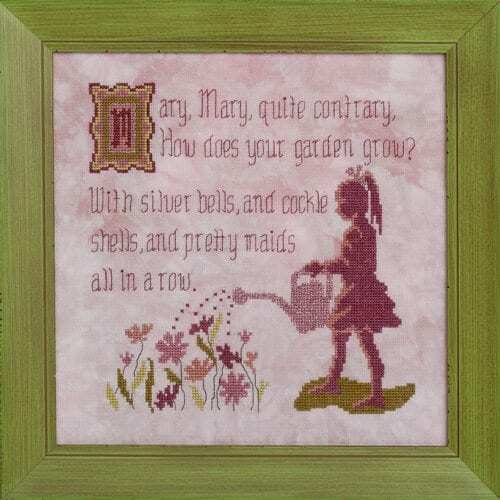 “Mary, Mary Quite Contrary” is a popular English nursery rhyme. Fabric: Stitched on 28ct “Quartz” Cashel Linen by Picture This Plus. Design Area: 8-3/8w X 8-3/8″h. Fibers: Uses a total of 8 colors of Sullivans floss and 1 color of Kreinik #4 Very Fine Braid. DMC and Anchor comparable colors are also provided. * Backstitching of flower stems.